The Magic Bullet replaces a food processor, blender, and coffee grinder, yet it occupies only the space of a coffee mug. It stays handy on your counter-top for instant meals and snacks. There are no buttons to push. Just load the ingredients into the short cup, the tall cup or one of the four mugs. Twist on the cross or flat blade, place the bullet on the power base, and press down - in seconds, you'll have chopped onions, minced garlic, grated cheese, spaghetti sauce, salsa, soup, chicken salad, smoothies, shakes and more. To heat or chill, simply place the magic bullet cup or mug in the microwave, refrigerator or freezer. Best of all, it saves you time because it does almost any job in the kitchen in 10 seconds or less! I am madly in LOVE with my Magic Bullet, I was completely amazed by the infomercials, and am even more amazed at the product itself. It does everything just as easily as shown in the advertisements. It grated cheese into a perfect size, whipped up sorbets and mousses, and is awesome for frozen drinks. It met my expectations, and I totally recommend it. This is not a typical blender and should not be operated as one. I used the shake technique to get big pieces down to be mixed up and it worked fine. For all of you who are contemplating buying one, I seriously recommend the purchase! The Magic Bullet can do a lot of the jobs your large mixer/blenders/processors can do. It takes up very little space and works like a charm with proper use. I definitely enjoy all the goodies I just "have to make" with this cool gadget! 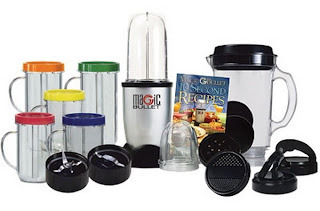 Magic Bullet is giving one of my lucky followers the chance to win one! One (1) winner will receive: The Magic Bullet. Ends 8.20.13. DISCLAIMER: All products received are complimentary for testing purposes from The Magic Bullet. All opinions stated are my own and are not influenced by any affiliates. What an incredible giveaway! I love the versatility of this blender. I am so excited for this review and fantastic give away!! I love the to go feature so you can grab and take to work! OMG!!! What an awesome giveaway!!!! Not sure but I loved the infomercials about it!!!! This looks like an awesome giveaway, I never had one of these before but would love to try it out! Quick & then you can make healthy goodies out of it! My favorite thing about the Magic bullet is how easily you can prepare healthy snacks. I've used a friend's and loved it!!! I would like one of my own!!! I love the to go feature! The Magic Bullet is one of my favorite products! SO HOPE I WIN!!!! I just love sorbets and smoothies!!!!! Ver la facilidad conque preparan licuados, jugos etc. Tengo un hijo de 18, que esta haciendo fisicoculturismoy me vendria muy bien el ganarme el Magic Bullet. Hoy es martes 13 ...El mejor dia para ganar algo!!! Suerte para todas. Pero lo deseo de Corazon el tener ese Magic Bullet!!! ;( Sin suerte, y con lo que necesito uno... Felicidades a la ganadora. Primera y ultima vez que me inscribo a un concurso asi. Muy dificil ganar... Gracias !!! i would love to win so i can make smoothies for me and my girls! Wow! Another great giveaway! I think it's cool how you made such a fresh fruit smoothie for us to see. It's one thing for a comapny to have a great infomercial, but when your friends tell you (AND show you) it's awesome, it's just wayy more credible. I'd love to win, to make Antonio actually get more fruits/veggies into his diet instead of loading him up with gummy vitamins and PediaSure. With MagicBullet, I can actually blend up the orange spinach water he loves so much ... and much cheaper! When Lilah was born, I wanted the BabyBullet soooooo bad - and we never got one. I'd love one, but they are a bit high priced for us right now. Another great giveaway! This would be cool to win as it would help out with a lot of the cooking i do for my family. I'd love to win! The smoothie looks delicious! I love that it's the perfect storage size. Sweet! I have been wanting one of these forever. It looks like a great asset to any kitchen definitely. The quickness & the simpleness of tossing everything in one place and having it at the ready to drink right from where it's in. Would be great for my daughter who loves fresh fruit but hasn't quite mastered the chewing and great for my nephew who is a picky eater but loves smoothies and doesn't realize there good for him! Thank you so much for hosting this giveaway! I am so excited! Can't wait to test it out!!! Thank you again!